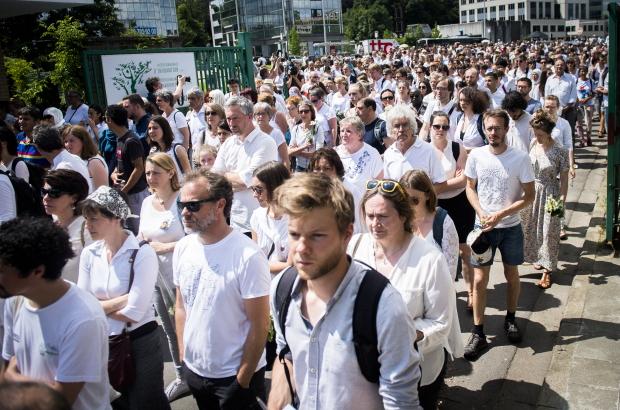 About 1,500 people dressed in white joined the funeral procession in Brussels on Wednesday for Mawda Shawri, the two-year-old Kurdish girl killed by a police bullet during a high-speed chase. The march set off from the Porte d'Ulysse migrant reception centre in Haren and headed towards the multi-confessional cemetery in Evere. "We have not invited any politicians to join the march," said Mehdi Kassou, head of the Citizen's Platform for the Support of Refugees, which helped organise the funeral with charity Médecins du Monde. "The comments of the political world have so far been rather unwelcome, even insulting." Mawda was shot in the head of 16 May by a stray police bullet fired at the van in which she and her parents were travelling. The vehicle on the E42 motorway between Namur and Mons was trying to flee the police, in circumstances still to be clarified by the investigation. Some 29 Kurdish migrants were found in the back of the van. They were heading for the UK.